Bikes are amazing. 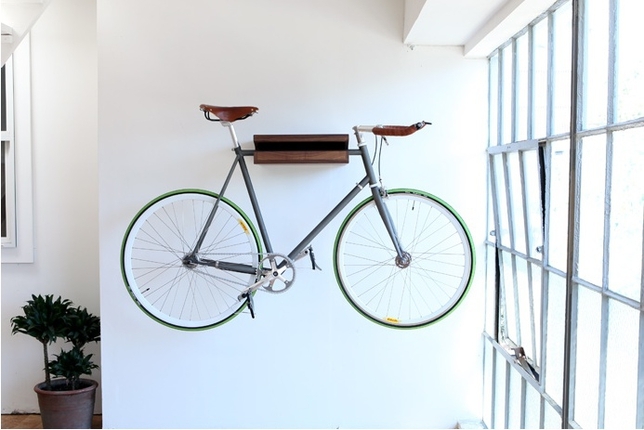 Quiet, lightweight and fast, they are the real future of sustainable transportation. 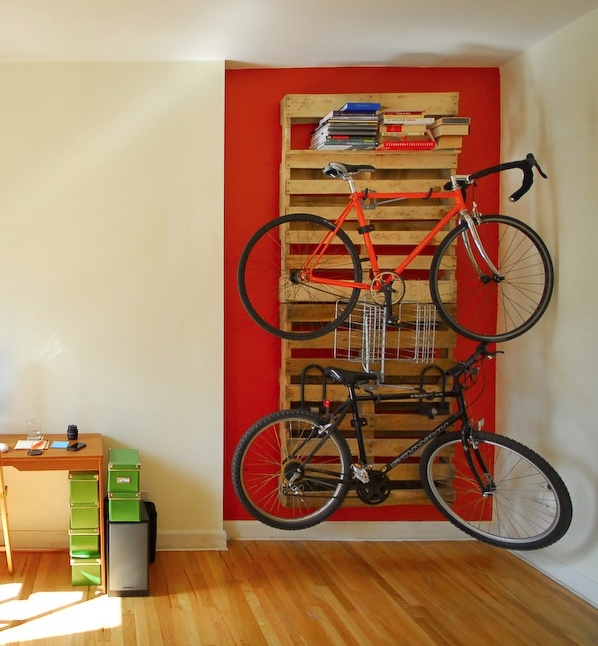 But for those of us who have our bikes crowding our small apartments, stacked alongside a wall, waiting for people to trip over them, they can sometimes get in the way. Luckily, a number of designers have tackled this problem. Being mass-produced out of plastic, is it relatively cheap at £59.95 at the online store and is available in America as well. The intention is to rekindle the human relationship with objects, encouraging an interaction of the visual with the tactile, expressing the simplicity of materials and honest construction – perhaps to stimulate curiosity and awaken emotions using contrasting forms and elements. No indication of price. More at Tamasine Osher Design. 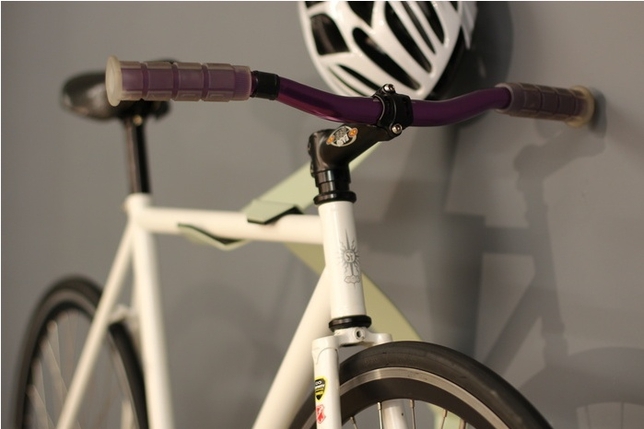 We live in a small downtown apartment, and if we happen to be dense enough to leave our bikes outside they wouldn’t last more than a few days, even with the priciest lock around. We lost a beautiful, vintage, hand-made Kleine in just such a way a couple years ago. So we bring our bikes inside. Given our storage issues, this makes navigating the entry hall difficult. I personally have tripped over or snagged a pair of dress pants on an awkwardly placed bicycle more than once. The solution? The Bike Valet. The design works on the same simple principle of leverage as the Cycloc, but the metal is, I think, a little more elegant. Available on Etsy for $75. The pallets shelves were rough and dirty. I picked 4 pallets up off a nearby street, made the shelves, and screwed them directly into my drywall with drywall anchors. Each pallet had about 10 screws across the pallet to distribute the weight; each anchor had a 40 lb hanging capacity. 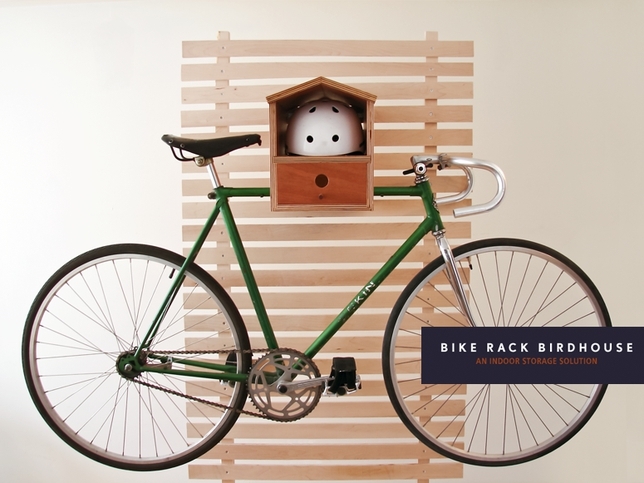 The bikerack birdhouse mounts on the wall easily and securely offering a innovative indoor storage solution for your bike and helmut. Made of Mahogany plywood and finished by hand with all natural non-toxic beeswax and linseed oil, this piece will lighten the storage load and brighten your home.